Harsh scolding “bzeee, bzeee.” Song is a medley of low warbles and harsh squeaky notes. Description: Sexes similar. 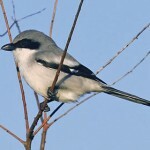 Bluish-gray above (slightly darker than Northern Shrike); white below with faint barring; wide black face mask that extends above eye and meets over hooked bill (not hooked as strongly as Northern Shrike). Small white rump patch. Black wings with white wing patches. Juveniles are brownish, with barring on breast and flanks. 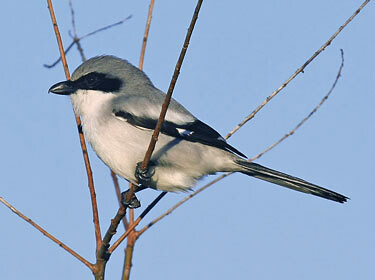 Habitat: Found in open plains and prairies with scattered trees or telephone posts for perching. Where in Nebraska: Common spring and fall migrant and summer resident across the state. Usually do not overwinter. Regular breeder. Fun Facts: Other names include Butcher Bird, and Cotton-picker, from its habit of using cotton in its nest. 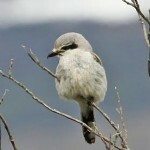 The Loggerhead Shrike uses thorns and barbed wire to hold large prey while it rips it up, and may wedge prey into a fork in a branch for the same purpose.